stood there asking ourselves. “What the heck am I even looking for?” Well we decided to dive into the guitar strings world to boil things down into some basic principals so you can make an intelligent decision. Guitar strings come in an extensive variety of size and material. Depending on the type of guitar they will be applied to, it may be important to fully understand the variations out there to make a proper decision and get the most out of your instrument. For starters, let’s have a look at the importance of choosing the correct strings. For instance, a classical guitar uses nylon strings. Not only is this to portray its legendary “plucking” sound, but also because the neck is made entirely of wood and contains no truss rod. This makes the neck much more fragile and able to withstand much less string tension, therefore applying steel or nickel strings could warp or even crack the neck. On a less detrimental note, it is also important to choose the right strings based on the intended tone of the guitar. An example might be putting strings intended for an electric guitar onto an acoustic. Although it wouldn’t actually harm the guitar itself, the lightness of the electric guitar strings will take away from the drive or “fullness” of the acoustic. It is also important to note that bass and baritone guitars require much heavier strings to be able to handle their low tuning. Using a lighter string at the lower tunings of a bass or baritone would cause them to be too loose and pitch-less. Trying to tune at the pitch of a normal guitar could also end up breaking the strings themselves, due to the bass having a longer neck. 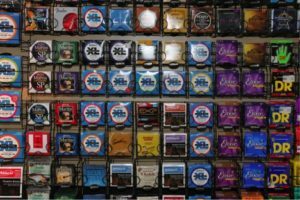 A large majority of guitar strings are going to be steel based and will be the focus of this article. Steel strings are made by taking two core wires and wrapping them around each other. The variations are due to the different sizes and materials used in this process. There are different types of guitar strings that are specifically meant for either acoustic, electric or bass guitars. Learn more about them below. The most popular types of acoustic guitar strings are phosphor bronze and 80/20. Phosphor bronze strings use a bronze core wire and a composite of 92% copper and 8% zinc as a wrapping wire. This type takes on a rich, mellow characteristic with an emphasized sustain. 80/20 strings have a core wire of bronze and a composite of 80% copper and 20% zinc. These acquire a bright punch with a quick dampening giving it a “twangy” characteristic, great for country and jazz styles. There is also the silk and steel or the “compound strings” which is basically a hybrid between traditional metal strings and nylon strings. This type usually produces a more gentle and mellow tone due to its relatively higher flexibility and lower string tension. Acoustic guitar strings will vary in gauge but will typically be heavier in order to produce the required depth and drive. Light gauge strings, being a common go-to, produce a brighter, sharper sound, found very prominent in styles rich with fingerpicking, such as bluegrass. Medium gauge is a primary in more strumming styles as it produces a thicker sound in acoustic guitars. There are some other variations in between but the principal is the same: the lighter the gauge the brighter the sound, while the heavier the string the warmer and full the sound. There is a much more diverse array of options when buying electric guitar strings. Since the electronics and amplifiers make the subtle differences more noticeable, the easier it is to change the sound and create unique sounds from your strings. Most common types consist of nickel-plated, pure nickel, stainless steel, chrome, titanium, cobalt, polymer-coated, and color-coated. Each is unique in its style and performance. Nickel-plated: These have increased attack and are fairly in between on brightness and warmth. Pure Nickel: Nickel strings are much more on the warmer side of the spectrum than nickel-plated. Stainless Steel: Steel strings have a high resistance to corrosion, and produce a bright, sharp characteristic. Chrome: These have a more dampened sustain and produce a warm, mellow tone. Chrome strings are common among jazz and blues guitarists. Titanium: These strings are hard to break. They are very strong and bright. Cobalt: Cobalt strings are very responsive to electronics and pickups, and produce a noticeable brightness. Polymer-Coated: These are slow to corrode but have a much shorter sustain time. Color-Coated: Generally aimed at a visual aspect, these are coated in a variety of different colors. These vary greatly on tone quality. Electric guitar string gauges commonly come in ultra-light to heavy. Ultra-light strings a preferred by guitarists who use whammy or vibrato as they are more responsive to the change in string tension, especially while using a distorted guitar tone. Light strings are considered the entry level standard due to them being substantially responsive and much easier on a players fingers. Heavier gauges of strings offer a driving sound for rhythm as well as drop D and other varied tunings. Rock and blues players prefer medium strings because they can stay quick on lead parts and still achieve the desired rhythm sound. With electric guitar strings there comes a variance in string winding techniques. This means that the wrapping wire may be made into different shapes. Round wound: the standard, has a brighter, punchier quality. However, these tend to wear down the frets in greater increments as well as producing more finger buzzes. Flat wound strings: are wound using a flat wrapping wire. They are less responsive and produce an immensely dark, mellow tone, making them the choice of a majority of jazz players. Half wound: consist of a partly round and partly flat wrapping wire. These retain a decent amount of punch while still being a fairly mellow sounding string. Strings can also be coated with nanoweb or polyweb. Both of these coatings reduce the number of finger squeaks and extend tone life by preventing corrosion. Nanoweb strings feel more like uncoated and produce a brighter tone whereas polyweb produce a warmer tone. Both of these types of strings do in fact cut down a portion of the available tone. Note that coated strings can cost twice as much as the non-coated types. However, coated strings are proven to last longer even in places with high humidity, so they are a good investment. There are two main types of materials used for bass guitar strings: stainless steel and nickel steel alloy, with the former producing a much brighter sound than the latter. Other alternatives include pure nickel which gives off warmer sounds and cobalt which provides a more noticeable clarity and output. The same principle applies to bass guitar strings: the lighter the set of strings, the brighter and sharper they sound. Consequently, the heavier they are, the more robust the sound they produce. While the latter appears to be more favorable for bass guitars, it is best to note that this gauge is harder to fret. Also, brand new instruments usually come with a medium gauge which is around .045 to .105, so that should be your starting point when choosing a new string gauge. The two main types of cores are round and hex cores. Round cores produce vintage-like sounds while the hex cores are known to give off a brighter sound. Hex cores are the most common type of core used in bass guitars. The winding method used in bass strings are either roundwound, half round, flatwound, and tapewound. Roundwound strings are the most commonly used bass strings nowadays. They typically use steel or nickel round wire to produce the brightest sound among the other types of windings. Half Round or Groundwound actually uses a round wire but it is ground down on one side so it appears to be flat. This combination produces a warm tone but is a lot smoother compared to a typical roundwound. The flatwound is another good option. It is perfect on fretless basses and is certainly smooth to the touch. The sound it produces is warm and mellow. The tapewound is made by wrapping nylon around another winding wire which results in more thud and an emulated sound of the upright bass. Coated strings are also available for bass guitars. Some of them even have a touch of color on them, making your guitar a lot more aesthetically pleasing. Martin Guitar Co., Elixir, D’Addario, Ernie Ball, ClearTone, and Fender manufacture most of the popular and widely used types of guitar strings. Each company is unique in their own ways but generally fabricate similar gauges. Guitar and bass strings come in different counts as well. Common guitar string counts are 6, 7, 8, and 12 string counts, where bass strings typically come in 4, 5, and 6 string counts. It is important to keep in mind that there is generally no proper types of strings to use, but rather relies on the preference of the player. This guide is based more upon the information about the different string types and gauges. The experimentation of different types of strings and materials is a beneficial process in the garnering of experience and knowledge. It is definitely important to have fun while trying out different types of strings and discovering a comfortable niche in your method. If you enjoyed this article, check out our ultimate guitar buying guide here! Learn The Secret To Improving Your Finger Strength, Dexterity and Speed!